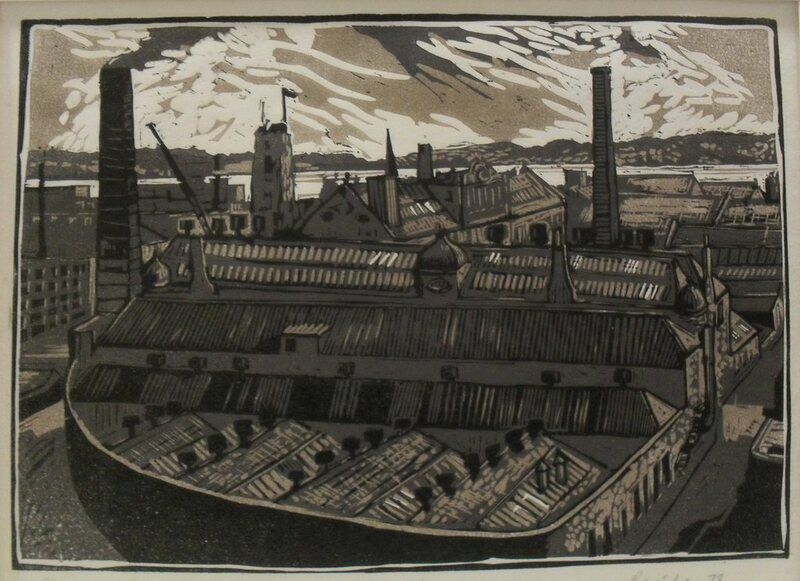 ‘Jute Mills- Lochee Road’ Linocut by Allan Beveridge, 1978. Image source: Dundee Heritage Trust. Having come to a dead end with both my surname line, and my search for Alexander Cruden‘s war story, I thought I’d try and find out more about the elusive George Leslie’s wife, Janet (Jessie) Trail (or Traill). Like many of my mainly working-class ancestors, Janet Trail left a very light trace on recorded history and I know her only through statutory BDM and census records. From available records, I believe she was born between 1832 and 1835 (1), and most likely in Auchtermuchty, Fife, Scotland (2). Although parish registers exist for Auchtermuchty for that time period, I have been unable to find any record of Janet’s birth (3). 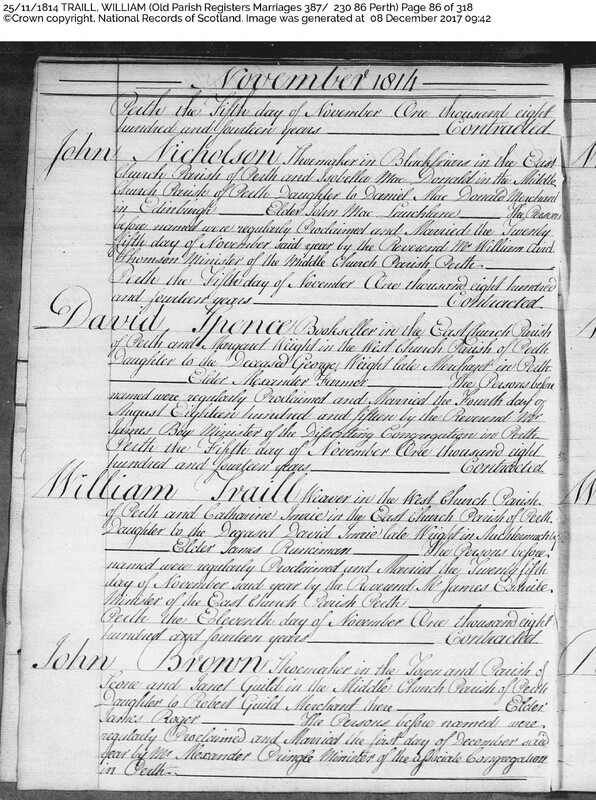 Both Janet’s marriage and death records list her parents as William Trail and Christian Birrell. I cannot find a marriage record for William and Christian, although it appears that William married a woman named Catharine Imrie in 1814. The OPR marriage record shows that William, a weaver, married Catharine “daughter to the deceased David Imrie late Wright in Auchtermuchty” in Perth, in November 1814. Old parish records tend to be very sparse in the information they provide, but the entry above is a useful exception. Knowing that Catharine Imrie’s father was from Auchtermuchty provides a viable explanation as to how Perth-born William came to live and raise a family there. William and Catharine’s marriage produced two children, Mary Trail b. 1815 in Perth, and John Trail b. 1817 in Auchtermuchty. I have been unable to find a death record for Catharine Imrie, so it is possible that she and William parted and that his subsequent relationship with Christian Birrell was a common law marriage. But equally, there seems to be a general paucity of old parish records in Auchtermuchty for this period. The first Scottish census for which records survive was taken in 1841, when Janet Trail would have been aged 6-9 years old. I can’t find any record of Janet, William or Christian in that census, though Janet appears in each subsequent census until her death. 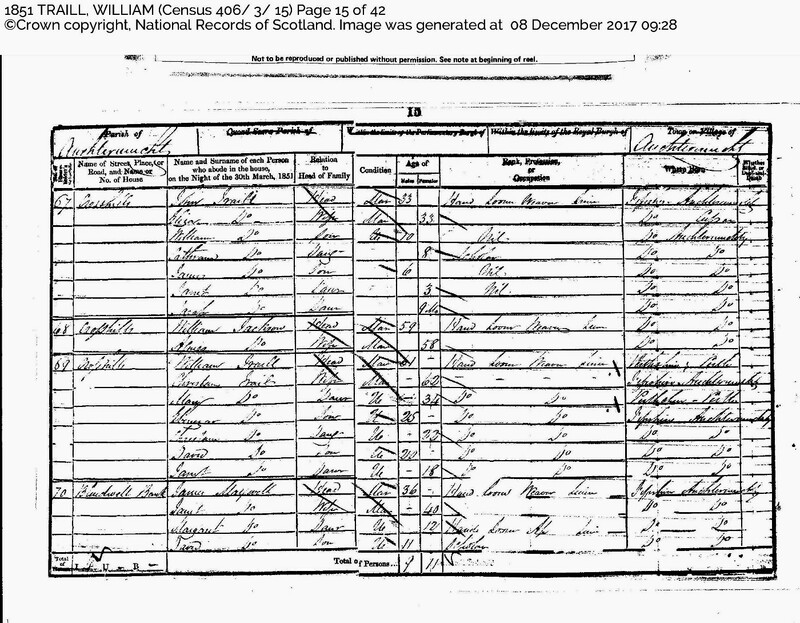 The 1851 census shows her aged 18, living in Crosshill, Auchtermuchty with parents William Trail and Christian Birrell, and older siblings Mary (aged 34), Ebenezer (25), Christian (22) and David (age 20). All members of the family, with the exception of the elder Christian, worked as hand loom weavers of linen. I cannot not find birth records for Ebenezer, Christian jr or David. I also don’t know if William and Christian had other children; none appear in the records. In October 1856 Janet Trail gave birth to a daughter Christina / Christian Trail, born out of wedlock in Auchtermuchty. The birth record does not name her father, but I’ve recently learned that I may be able to obtain this information from Kirk Session records, via the website Old Scottish Genealogy and Family History, so I’ve sent off a request for this. In August 1857, Janet married George Leslie in Auchtermuchty. The record shows George’s age as 30; Janet’s as 23. Both Janet’s parents, and George’s (John Leslie and Elizabeth Robertson), are recorded as being alive at the time of the marriage. 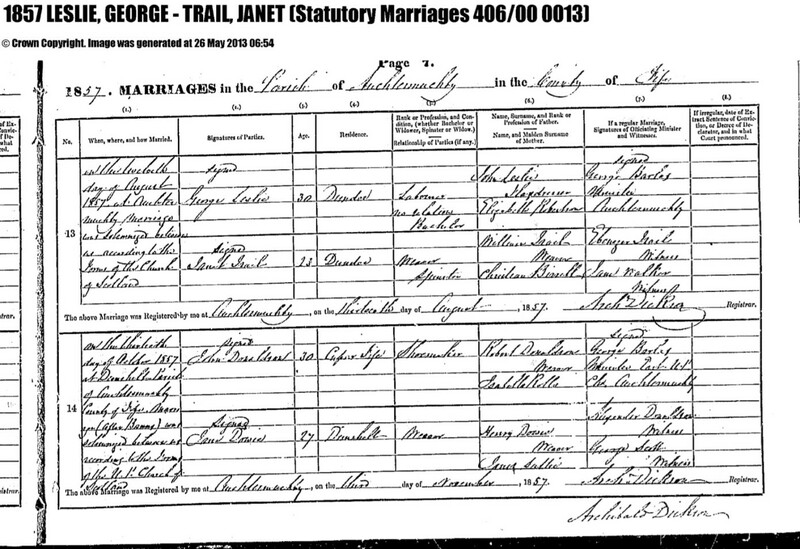 Marriage record, Janet Trail and George Leslie, August 1857. Source: Scotland’s People. Janet and George both gave their address at the time of marriage as Dundee, a town about 20 miles away in the county of Angus. If Janet was living in Dundee at the time of her marriage, she must have moved there sometime after her daughter’s birth the previous year. Janet came from a family of linen weavers, and it’s likely that the move to Dundee was in search of work. Weaving had become an important industry in Dundee as early as the 17th century, when Master Spinners and Weavers from Flanders were brought to the town to “teach the natives.” The intention was to prevent Scottish wool being exported to Flanders and then re-imported as finished cloth. By the 19th century, jute had replaced wool as the most important fibre in the Dundee weaving industry; just as large mills with mechanised spinning and weaving looms had largely replaced the cottage industry of hand-weaving. (In the 19th century) over 50,000 of Dundee’s inhabitants were working in over 100 jute mills, with more working in mills for linen. This booming business in Victorian made many rich jute barons as they were known. But these were the few profiteers of the industry, and the conditions were dire for the vast majority of workers. As many as three-quarters of the workers were women and children, who could be employed for cheaper rates than men. The wages were low, and the risks were high … injuries, accidents and occupational hazards were commonplace. It’s difficult to imagine the working conditions, dust would be everywhere getting in the eyes, noses and mouth. Constant noise from the machines was deafening, and in fact many workers went deaf after spending too much time inside the mill. The machinery also produced lots of heat, grease and oil fumes which led to a condition which was known as ‘Mill fever’. Bronchitis and other breathing problems were also common. As well as the terrible conditions in the mills, the huge increase in population from 1840 to more than triple within 60 years was not met by an increase in house building. Overcrowding became a huge problem with entire families living in a single room. These conditions remained with 70% of people living in just one or two rooms in 1911. Wages in Dundee were one of the lowest in Scotland during this time, whereas the cost of living was the highest. Low wages meant little money for food, medicine or other items necessary for a good quality of life. I can only imagine what it must have been like for Janet to leave her rural home in Auchtermuchty –almost certainly leaving behind her baby daughter too – and work 12 hour days under such conditions. Sometime within the first year of their marriage, Janet and George returned to Auchtermuchty to live – in the same street as Janet’s parents. Their first child, son George Leslie, was born there in September 1858. By October 1860, when son William Leslie was born, the couple had returned to Dundee. The address given on William’s birth certificate was South Road, Lochee. Six months later, when the 1861 census was taken, the family was still on South Road (described on the form as “nearby the railway line, prob South Road”). The household consisted of George, Janet, Christine, George, William and two Irish lodgers. Lochee was known in the 19th century as “Little Tipperary” because of the large number of Irish immigrants who settled there to work in the jute mills. Certain areas such as … Lochee were especially overcrowded due to the common practice of people living close to their workplaces. … Overcrowding inevitably led to poor sanitary conditions. Diseases including cholera, typhus and smallpox thrived in the city, and together with accidents and other infections and fevers contributed to Dundee having one of the highest death rates in Scotland, and the highest infant mortality rate. The growing Leslie family did not stay long in Lochee. In July 1862, when Janet gave birth to her second daughter, Elizabeth Leslie, they were living in the small rural village of Inver, in the parish of Little Dunkeld, Perthshire. This is around 28 miles from Auchtermuchty, and a similar distance from Lochee. George’s occupation on the birth record is ‘Carter.’ I guess the modern-day equivalent of this is “delivery driver.” I have no idea if George owned the horse and cart he drove, or whether he was employed by someone else. According to the 1868 National Gazetteer’s description of the Parish of Little Dunkeld, “The chief wealth of the parish consists in its oak woods.” Perhaps George worked for a sawmill or landowner, carrying logs or finished timber? By 1865, the family had returned to Auchtermuchty. The birth records for Isabella Paterson Leslie (b. 1865), David Leslie (my gg grandfather, b. 1867)) and John Robertson Leslie (b. 1871) all show the family’s address as Pitmedden Wynd, off Crosshills, where Janet’s family lived. George seems to have continued working as a carter, at least for a couple of years after his return to Auchtermuchty. But in 1867, when my great grandfather David was born, George’s occupation is given as Labourer. The same is recorded on the 1871 record of John’s birth. George Leslie is missing from the 1871 census record for the rest of his family. The form records Janet (Jessie) Leslie is head of household. His absence must have been temporary, as he is recorded as the informant on his son John’s birth record a month later. In February 1877, Janet Trail, aged between 42 and 45, gave birth to her last child, Janet Leslie. By this time, the family had moved to Mill Street in Abbotshall, which now part of Kirkcaldy. George’s occupation is listed as Mason’s Labourer, and he seems to have continued to work in a similar capacity until his death, aged 70, in 1902 (4). Janet outlived her husband by 11 years. She continued to live in Kirkcaldy, with three of her adult children, William, John and Jessie – none of whom had married. The 1911 census shows them at 120 Links Street, Kirkcaldy. William, aged 50 was a labourer in the linoleum works; John aged 40, a pottery kilnsman, and Janet jr. aged 33, a weaver in a linen factory. Janet Trail died two years later, aged 78, on 4 March 1913. Her cause of death was recorded as senile decay and bronchitis, and the death was reported by her eldest son, George Leslie. As with so many of my ancestors, it seems that no matter how much research I do, I cannot really know them. I have no photographs of Janet Trail, her husband, siblings or children; no personal documents or memorabilia. I know from historical accounts something of the life that she and her family led – as craft workers in an industry revolutionized by mechanisation, as factory workers in 19th century Scotland, as permanent tenants, never secure in their homes. The rest, I must imagine. The 1911 census recorded her age as 76 (implied birth year of 1835); the 1901 census as 68 (1833); 1891 as 58 (1833); 1881 as 49 (1832); 1871 as 38 (1883), 1861 as 26 (1835); 1851 as 18 (1833) and her marriage certificate in 1857 as 23 (1834). In all found records, her birthplace is given as Auchtermuchty, Fife. I set wide search parameters, tried as many variations on Janet (including Jenet and Jessie) and Trail (also Birrell) as I could think of, looked Church of Scotland, Catholic and non-conformist church records and even tried scanning all the births recorded in Auchtermuchty for a twenty year period. The 1881 census lists George as a Land Labourer. 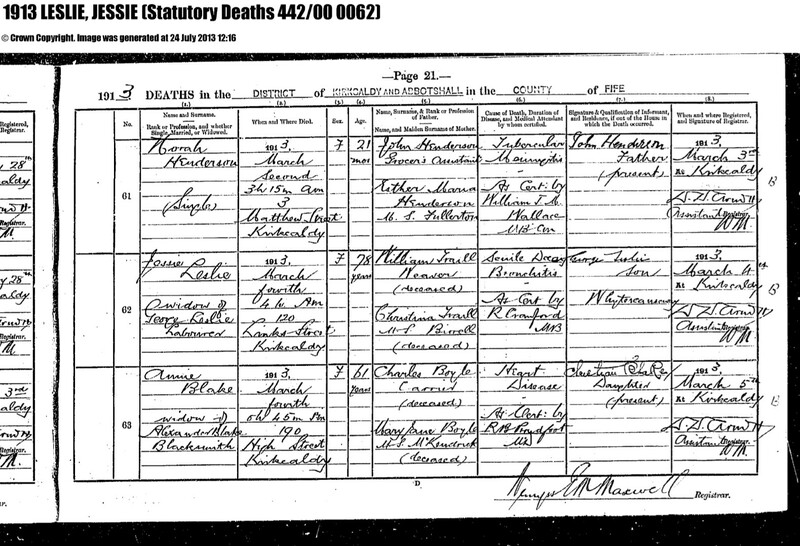 In 1891 he’s a Carter, 1891 he’s back to being a Labourer, and his death record shows occupation as Labourer.